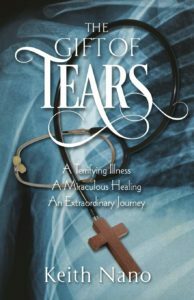 The Gift Of Tears by Keith Nano is the true tale of a miraculous healing showing that the miracle working God of the Bible is the same yesterday, today and forever. Keith Nano provides the background to his faith journey. He raises his family to know God. This is their story of the day tragedy struck and how their faith in God and in people would be stretched and enlarged. As their son Jacob was struck down and fighting for his life, following a bout of pneumonia, Keith Nano and his family saw the family of God in action. Practical help was provided as well as prayers and moral support. “They came to hug us and to pray with us. They came to cry with us.” The reader sees people helping people. Being on the receiving end of such generosity was hard as Keith Nano was more used to giving and not getting. He learnt to receive with grace all that was offered. “They just showed up.” Prayer teams mobilised. Charity events were organised. Practical goods and help were given. The innate goodness of people shone as Jacobs Army mobilised.